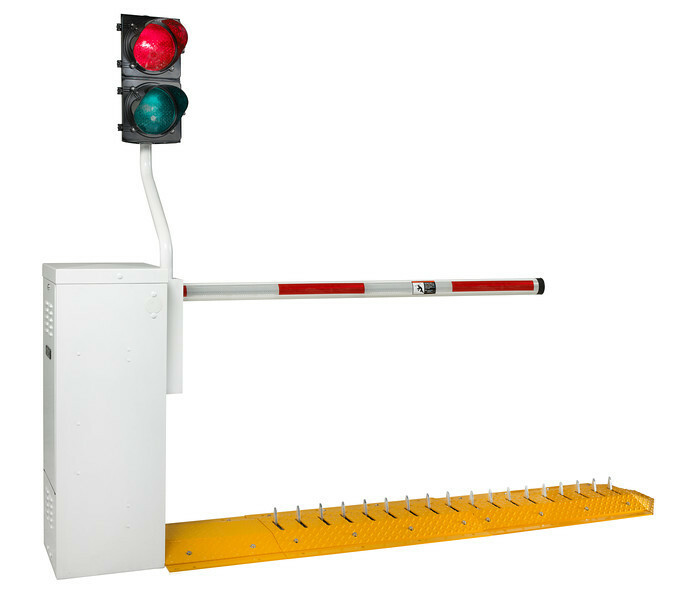 The DKS model 1603 Barrier Gate Operator / Automated Spike System is designed as a modular system allowing for easy flexibility in different applications and easy installation. The 1603 operator is designed with many advanced features and mechanically links the spikes to the barrier arm. The surface mount spikes are easy to install and do not require any trenching or excavating. The 1603 auto-spike system is ideal for parking lots, rental car agencies, schools, car dealerships, government agencies, or in any application where a higher degree of traffic control is preferred. A complete 1603 / auto-spike system consist of several different components. A typical system will require a 1603 operator, transfer box (transfer box is factory installed to the 1603 operator), tunnel section(s) as needed, spike section(s) as needed, end cap, barrier arm, and arm hardware kit. A traffic signal and/or warning sign is required with this system. 14 ft. aluminum barrier arm (not included, order separately). Dimensions: 15.25"W x 43.5"H x 15.5"D.